Hey, some guys do their best work drunk! 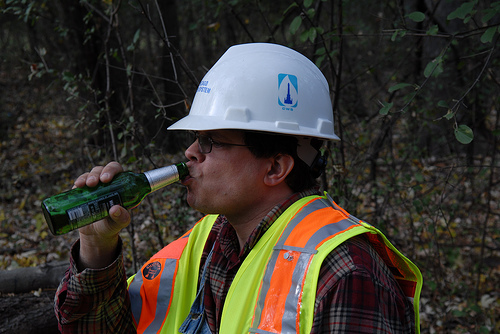 And, anyway, what’s a few beers, one city worker to another? PAT, WHAT ABOUT THE POLICE & FIRE DEPT. THE POLICE HAVE A SWIPE CARD MACHINE & NEVER USE IT.DOES THE FIRE DEPT HAVE ONE.THEY LEAVE EARLY & COST US TAX PAYERS $$$$$$$$$$ MILLIONS.Y R WE SWIPING IN % OUT , BUT THEY DONT NEED TO.U SHOULD LOOK INTO OTHER DEPTS.THERE ARE PROBLEMS ALL OVER. THANKS. (Response) I am on my way. come on Pat, THEY ARE DOING THE SAME THING YOU ARE,TAKING THE TAXPAYERS MONEY WHILE ON CITY TIME!HAVE YOU NOT BEEN PART OF THAT?WHAT ABOUT WORKING AND TAKING PICTURES AND DOING INTERVIEWS FOR THIS SITE AT THE SAME TIME?IS THAT DIFFRENT.GO BUMP HEADS AND ARGUE ALL YOU WANT WITH YOUR NEW BUDDY FRANKIE C.
I will forward this to my friends at fox news Pat.Thanks you should get an acadamey award for this one McDummy. Pat could have sent this in to the news but he was to scared.Hell he dont even answer anybody,Hes like me if I dont benifit from the attention then oh well.Game on McNuggett!!!!! Do you forget all the times you campianged for your wife in the 48th Ward carring a bottle of Lite with you. I am amazed you could publish this given your own drinking problems. (Response) And what spelling problems you have. I needed a “Light” to see at night. I drink bottled water, do you think that is a problem? Gee…. McDonough you make very funny videos. Who is that guy, he is very handsome. Bruce Bruce.